Tomorrow afternoon, U.S. Secretary of the Navy, Ray Mabus, will hold a ship-naming ceremony at Iowa State University for a new Virginia-class attack submarine. He will be joined in the Campanile Room at the Memorial Union at 3 p.m. by Iowa Gov. Terry Branstad and ISU President Steven Leath, both of whom are scheduled to speak. The ceremony begins at 3 p.m. The more important news: the boat will be named USS Iowa. 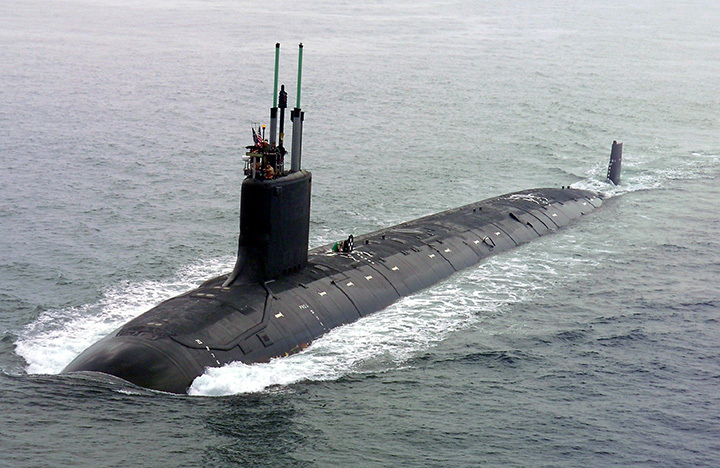 The Virginia class is the newest attack submarine class, and is replacing aging ships of the Los Angeles class, both in terms of technology and capability. Each 377-foot-long boat in the class, weighing in at 7,800 tons, has enhanced stealth, sophisticated surveillance capabilities and special warfare enhancements that will enable it to meet the Navy’s multi-mission requirements. USS Iowa will have a top speed, fully submerged, of more than 25 knots (29 mph). She will have the capability to attack targets ashore with highly accurate Tomahawk cruise missiles and conduct covert, long-term surveillance of land areas, littoral waters or other sea-based forces. Other missions include anti-submarine and anti-ship warfare; mine delivery and minefield mapping. She is also designed for special forces delivery and support. USS Iowa‘s nuclear reactor plant will not require refueling during the planned life of the ship, reducing lifecycle costs while increasing underway time. She also will be capable of running, submerged, for up to three months at a time, without resurfacing. She will have a crew of 120 enlisted sailors and 14 officers. The boat, which will have the sail number SSN 797, will be the fifth to carry the name USS Iowa. 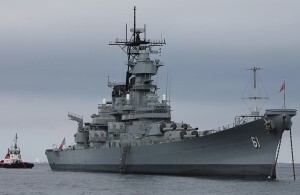 Most of the ships in the Virginia class have been named for states, including several states used in the World War II-era Iowa-class battleships. The battleship USS Iowa is now a museum ship anchored in Los Angeles and has been stricken from the naval registry, meaning the name is now available for use on another ship. USS Iowa will be built under an agreement between General Dynamics Electric Boat and Huntington Ingalls Industries-Newport News Shipbuilding and will be delivered by GDEB located in Groton, CT. More than 35 million labor hours went into the Virginia-class design. It takes about 9 million labor hours to build each boat. Once the keel is laid, and until delivered to the Navy, she will be known as PCU Iowa. PCU stands for Pre-Commissioning Unit. USS John Warner, the latest Virginia-class submarine to be commissioned, took about six and a half years to construct following her official naming ceremony.